Mining executives met this week in a MINExpo convention in Las Vegas and the talk was mostly bullish. They heard Newmont CEO Richard O’Brien say that gold is presently trading more like a currency than a commodity. O'Brien told the audience that investment is the largest growing component of the gold market, currently comprising about 40% of demand. As more currencies weaken, such as the U.S. dollar and the Euro, O'Brien suggests the current bull market for gold will continue well into the future. According to O’Brien, mine production is actually a miniscule part of overall gold supply, accounting for only 2% of above ground stocks, he said, estimating that a grand total of only 2,900 tons of gold will be mined this year compared with 2,818 tons last year. However, gold supply will eventually be challenged as it becomes more and more difficult to find gold; it now takes an average of 17 years to mine gold from exploration to discovery. There has not been a significant discovery of five million ounces or more in reserves in 10 years. The numbers tells us that annual global demand is considerably more than the amount of gold extracted from the ground. Demand was about 3,500 tons in 2000 and rose to 4,486 tons by 2011. Simple mathematics shows a deficit. In the past central banks were happy to sell some of their gold holdings and there is even an international treaty limiting the amount that they can sell each year so as not to undercut prices. But in the past few years instead of sellers, central banks have been net buyers. The cost of exploration expenditure has gone up but the number of major discoveries has been falling. In addition, the average size of major deposit discoveries is declining as well as the average grade of discovered gold. Less gold in the rock makes it more expensive to extract. If it takes an average of 17 years to mine gold from exploration to discovery, the lack of major recent discoveries points to a production shortfall in the next decade with the gap between demand and production yawning wider. Speaking of mines, Chinese and Venezuelan officials signed an agreement to jointly develop one of the world's largest gold mines. The agreement on Las Cristinas gold mine was signed Friday by Venezuelan government officials and the state-run China International Trust & Investment Corp. The mine in southern Bolivar state is estimated to hold about 17 million ounces of gold. Summing up, there are some steps that are made in order to increase the supply of gold, but they will not really come into play (increase the supply substantially) in the near future. With higher demand and unchanged supply, the price should eventually move higher. In the chart a very brief consolidation is seen with prices then correcting somewhat. The decline has not been nearly as spectacular as past declines and it is barely visible from the long-term perspective when compared to the size of the previous rally. We could very well see additional price declines before the next powerful move to the upside, simply based on the fact that the August – September rally was not followed by a meaningful correction just yet. No market can move in one direction without corrections and signals from other market also suggest that silver may need to take a breather. Now, let’s move on to a chart that shows us the performance of the white metal relative to gold. This chart can help us determine which of these two precious metals will outperform the other in the near future. In the silver to gold ratio chart, the medium-term picture has recently improved greatly. The RSI level is no longer overbought, and the ratio moved to a support line without breaking it. The medium-term picture is bullish. 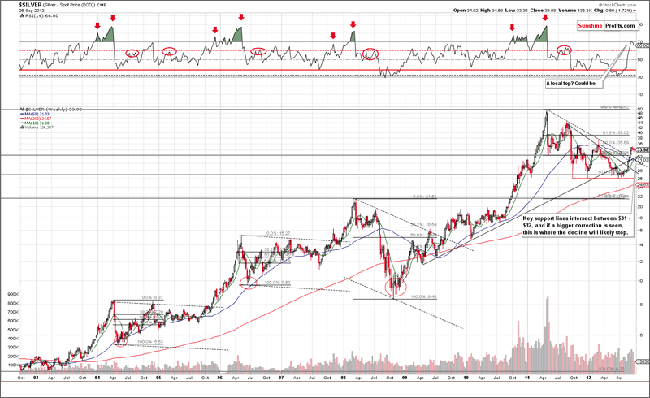 This means that when the next part of the rally takes place, silver may prove to be more profitable than gold. Summing up, silver looks like it’s about to correct, and this correction may or may not be seen immediately. A few days of consolidation is possible before a price correction, and it seems best to wait before entering any speculative long positions at this time. Also, when the rally resumes, the white metal may yield better returns than the yellow one. Interested in increasing your profits in the precious metals sector? Want to know which stocks to buy? Would you like to improve your risk/reward ratio?